Kidney disease does not sneak up on you without warning signs being present. You just need to know what to look for in order to catch it early and be able to take action to prevent it from becoming a serious health concern. According to the National Kidney Foundation, one in three Americans is at risk for kidney disease. Over 26 million American adults have chronic kidney disease. The National Kidney Foundation also says that kidney disease often has no symptoms until it is quite advanced. Your kidneys are mirror images of each other and the two organs reside in your lower back beneath the muscles. They are responsible for removing waste and fluid that is not being used by the body’s cells through the urine. There are different types of kidney problems including kidney infection, kidney failure, polycystic kidney disease, cancer, and kidney stones. Kidney failure is also called renal failure. A doctor can determine if you have any of these kidney diseases by testing either your urine or blood or both. Risk factors associated with signs of kidney disease include diabetes, smoking, high cholesterol and hypertension. Early detection is important so that steps can be taken to prevent the disease from progressing. You can reduce your risk of kidney disease by making lifestyle changes. 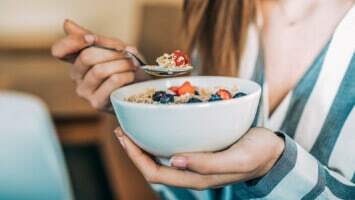 Start by adopting a vegetarian diet that is low in fat, limiting salt and alcohol intake as well as getting regular screenings with a physician. The consequences of having advanced kidney disease can include dialysis, the need for a kidney transplant, or premature death. 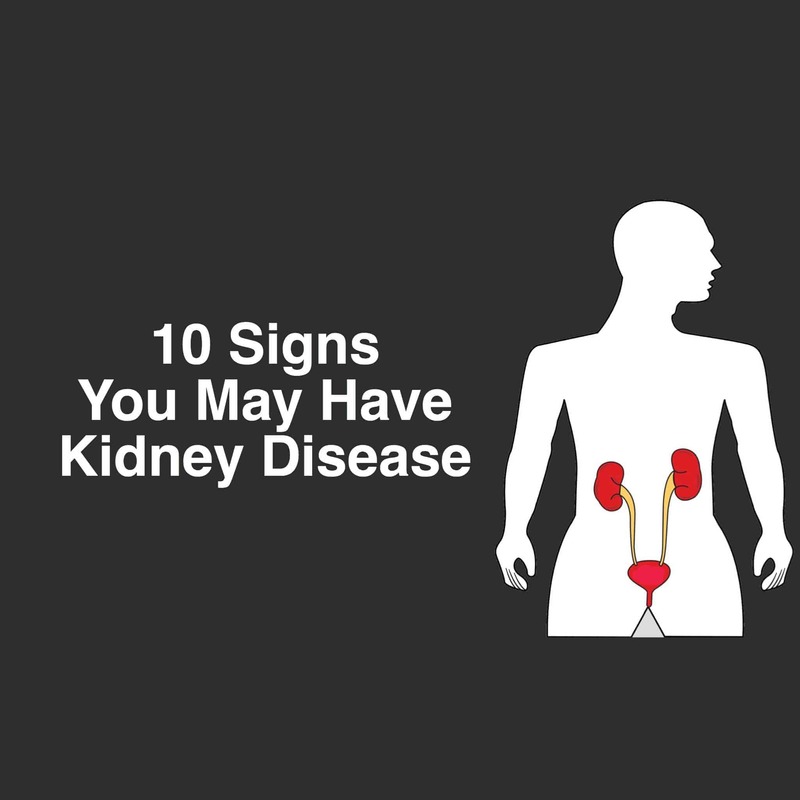 It is definitely beneficial to your health to see if you have any of the following 10 warning signs of kidney disease and consult with a doctor quickly. Backaches and joint pain could be signs of an injury, or they could be signs of a kidney infection. Read more about helping flush your kidneys in our article here. Blood can be passed into the urine but most often, this is only seen under a microscope. However, being dehydrated can result in dark urine. Painful urination is another warning sign of a kidney disease. Going to the bathroom either too often or not often enough can be a sign of a problem with the kidneys. You may also have the feeling of needing to use the bathroom but being unable to do so. A buildup of waste that is not flushed out of your system can make you have a sense of a metallic taste in your mouth. Also, people may notice that you have particularly bad breath which smells strangely of ammonia. The buildup of waste that the diseased kidneys are not removing can also give you a nauseated feeling. The nausea can become severe enough to make you vomit. This is also another way for your body t try to rid itself of food that cannot be properly processed anyway. When the body is not able to process the nutrients that you are consuming, there will be a buildup of these in your system. A buildup of protein and an inability to process it will actually cause you to have less desire for protein. It just won’t sound good to you. Kidney disease can also cause a lack of appetite in general. When your kidneys aren’t functioning well, you can also have cravings for strange things like chewing on ice or wanting to eat inedible substances like dirt or chalk. When you use the bathroom to pass urine, check to see if it is bubbly or foamy looking. The bubbles can indicate a presence of protein which is being passed in the urine. Typically the protein is used by the body rather than excreted so this is a warning sign of a potential kidney disease. Weakness can be caused by many reasons, but in combination with the other signs listed here, it is definitely cause for concern. Anemia can be associated with kidney disease and that is likely what is causing your fatigue. Anemia is a symptom of kidney disease because the kidneys also help the blood to carry oxygen. When the kidneys are diseased, the number of red blood cells drops. The extreme fatigue can cause mental confusion. Swelling means that fluid is being retained in the body when it would normally be excreted through the urine. When the kidneys are not functioning properly, they are not able to handle the extra fluid properly. Swelling can happen in multiple places in the body. This swelling is also called edema. The kidneys are not excreting fluid as they should and the body is retaining water and salt.